Easy slow cooked curry that will delight the senses and warm your tummy on a cold winters night. Place potatoes and onions in slow cooker. Mix coconut milk and massaman curry paste to slow cooker. Mix well to ensure potatoes and onions are covered. Mix stock, fish sauce, lemon juice and brown sugar in jug and pour into slow cooker. Stir ingredients. Place cut steak pieces in bag filled with flour. Shake bag to ensure steak pieces are fully coated. Once coated place steak in slow cooker. Stir and cook on low for 7 hours. After 7 hours add peanuts to slow cooker and cook for another hour on low. Serve with rice. Sounds like a great winter meal. Hoping this is ok without peanuts. Such a perfect Winter recipe,sound’s delicious! Thanks. I love using my slow cooker – thanks! Always looking for new slow cooker ideas, this looks fab! This is on the menu all through winter; so satisfying! 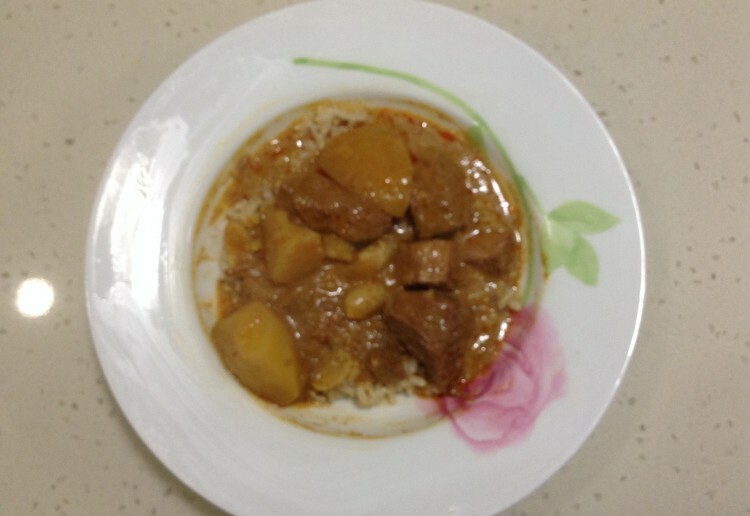 Massaman curry is my absolute favourite curry; just love this dish and love potatoes. I would happily eat this dish all of the time! Thanks!